Mr. [d. 1970] and Mrs. Lester Francis Avnet, Great Neck, Long Island, NY; purchased 19 October 1971 by NGA. Recent Acquisitions and Promised Gifts: Sculptures, Drawings, Prints. National Gallery of Art, Washington, 1974:217. Kaufmann, 1982, No. 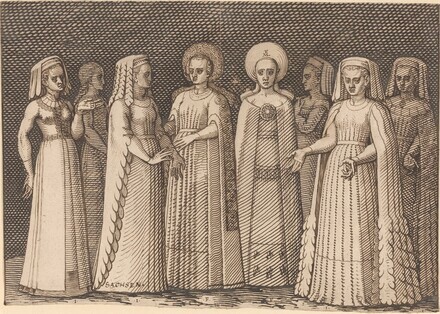 14 (as "Eight Women in Old German Costume"). Kaufmann, Thomas Dacosta. "A Census of Drawings from the Holy Roman Empire, 1540-1680, in North American Collections" Central European History xviii, 1 (1985):4-13, 70-74, 91.